2Çanakkale Onsekiz Mart University Faculty of Medicine, Department of Family Medicine Çanakkale, Turkey DOI : 10.31086tjgeri.2018137962 Introduction: The elderly population has the highest rates of drug use and is more sensitive to drug effects. Inappropriate drug use can cause unwanted effects in such a population. We aimed to evaluate inappropriate drug use in the elderly population according to Beers criteria. 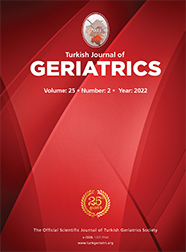 Materials and Method: This cross-sectional, descriptive study used a simple systematic method to select individuals aged ?65 years residing in Kepez district of Canakkale. All medicines used by participants were identified and evaluated according to Beers criteria. Results: The mean age of the participants was 74.1±6.5 (65?91) years. In our study, 95.7% of the participants had at least one chronic illness and 84.5% had at least three chronic illnesses. The mean total number of drugs used was 5.0±3.2 (0?15). According to Beers criteria, inappropriate drug use was detected in 35 (30%) instances. Non-steroidal anti-inflammatory drugs were the most frequent inappropriately used drugs in the study population [n=13 (11.2%)].